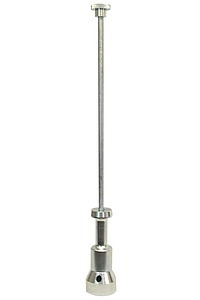 4" (101.6mm) Drive Head For determining in-place density of soil by driving a thin-walled tube into the soil mass to obtain a relatively undisturbed sample. Typically used to verify compacted fill placement, or to obtain samples from the bottom of shallow excavations. Zinc-plated, steel drive head and sliding weight hammer used with separately ordered drive tubes. 10 lb. drive head has a shock reducing spring to guard against fatigue failure.